It’s that time again. Thursday’s Solar Eclipse marks the next phase in the cosmic unfolding of 2018, a year which promises to be, if anything, more volatile than its predecessor. At 27 Aquarius, this eclipse opposes and reactivates the “American Eclipse” of August 2017 at 28 Leo. It also just happens to be exactly on the Moon of the Sibley chart for the US, representative of its people. Cast for 4:06 PM EST in Washington DC, the chart shows an Eris/Uranus conjunction at 22 and 25 Aries on the 27 Aries MC. Discontent, strife and revolution are in the air, and impossible to miss; a closer conjunction of these points in 2016 brought us Donald Trump, the rank outsider who carried the banner of turmoil and disruption straight to the nation’s capital. But as the current resident of 1600 Pennsylvania Avenue, he has now morphed into the ultimate insider, and any continued discontent with the system, allied to disappointment over his performance, will now be directed to his unseating. Also on the MC, from the Tenth House side, is asteroid America, at 2 Taurus. This places the US citizenry front and center, in a powerful position to affect the administration, reframe the government, and reaffirm that the voters are, in fact, the ones running the show. And speaking of Russia, its eponymous asteroid opposes America from 6 Scorpio, on the 27 Libra IC, a pretty obvious allusion to their inimical intent to undermine the foundations (IC) of our democracy. This basic polarity keys on two major configurations. First, a Grand Cross is formed by its square to the Horizontal Axis of the eclipse chart, at 8 Leo and Aquarius. Bound up with this are asteroids Arachne and Icarus at 3 and 7 Aquarius, on the Descendant. This suggests intrigue, a web of deceit, complicated, intermeshed motivations and outcomes (all Arachne) and considerable risk-taking, foolish judgments and impending catastrophe (all Icarus). All strongly tied to eclipse energies as they apply to the nation’s power center (the chart set for DC, which forms this pattern due to those angles), which promote dramatic change and sudden revelation. Second, the America/Russia polarity is also the string of a Kite pattern formed from the exact Grand Trine of Russia at 6 Scorpio, asteroid Moskva (Russian for “Moscow”, its capital) at 6 Cancer, and Venus at 6 Pisces. The celestial timing required to bring these three factors into this exact aspect is remarkable, and I would propose that it doubles down on the importance of the Bear to America’s 2018 future, highlighting Russia’s intrusion into the American psyche via forays into social media, partially Venus-ruled (Venus as the “social” half of “social media”, Mercury being the other operative planet in this construct). Recalling that asteroid Russia is stationary direct in the Trump administration chart, squared Donald Trump’s Mercury and Nemesis in his birth chart, and exactly conjunct the USA’s politics-ruling Jupiter, and that asteroid Moskva is squared the Mercury of the Trump administration, exactly squared Donald Trump’s Sun, and conjoined Neptune and the MC of the US chart, we can get a sense of just how embedded that country is in the current US political climate. There is a second Kite formed by Moskva’s exact opposition to Saturn at 6 Capricorn, representing the federal government generally, and the chief executive specifically, with that direct line to the Kremlin symbolized by the exact Moskva/Saturn opposition. A defiant Donald Trump views the August 2017 Total Solar Eclipse without aid of eclipse glasses; he is, after all, the most powerful man on earth, and don’t need no stinkin’ glasses! Let’s backtrack a bit and take a closer look at that Sun/Moon eclipse degree. As we noted, it’s exactly on the USA Moon, its people, but it’s not alone. Also here are Damocles and Mercury, at 24 and 25 Aquarius, well within the eclipse’s scope. Damocles suggests a doom hanging unseen overhead, based specifically in decisions taken and policies enacted, both Mercury-ruled, and these directly impact the American people, with the eclipse’s contact to the US Moon. The eclipse T-Squares an opposition from TNO Sedna at 25 Taurus to Jupiter and asteroid Toro at 22 and 24 Scorpio. This spells political (Jupiter) isolation (Sedna), and calls greater attention (if possible) to bullying (Toro) tweets, statements, and other communications (Mercury), identifying these as the source of the impending doom (Damocles). The degree also highlights Donald Trump’s natal Ophelia by exact conjunction, a point which rules madness and mental deterioration. We’ve seen how concern over the President’s mental fitness for the job became a matter of public discussion at the prior eclipse which was opposed Ophelia with a one degree orb. We can confidently expect this issue will be raised again, in more emphatic form, with the exact conjunction. This eclipse also sits astride Trump’s natal Descendant, and in fact sets off all four angles of his birth chart. 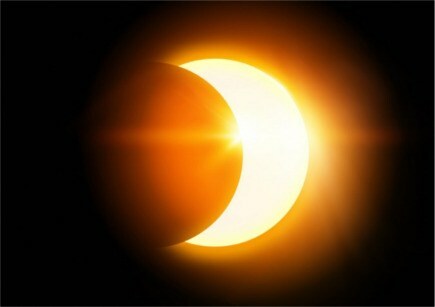 Where the prior eclipse, on his Ascendant, altered how others saw him, this one promises to change the ways others relate to him. This can cut both ways. If we look to recent developments, we can clearly see a growing rapprochement between Trump and Republican allies in Congress, who seem to have decided to go all-in for the President, whatever befalls. After beginning to make itself heard at the last eclipse, nascent Republican dissent and criticism of Trump’s behavior has dwindled to the rough auditory equivalent of a fart in a tornado. This trend is not an encouraging scenario for where the ruling Party is headed, but, if adhered to, it does have the merit of firmly binding the GOP to Trump’s fate. They sink or swim with him, and the water is getting very, very choppy. The square to Trump’s MC/IC axis, at 24 Taurus/Scorpio, suggests a major reset both in matters of career and the home. In this instance, if Trump were to be impeached or otherwise removed from office, it would of course have a direct, dramatic impact on both spheres of his life, as an ignominious end to his career and a definite change of residence, no longer eligible for public housing at 1600 Pennsylvania Avenue. The eclipse also opposes his natal Mars at 26 Leo and exactly opposes asteroid America at 27 Leo; this indicates an embattled, conflict-ridden period (Mars) and can bring changing perspectives about him among the American people (America) into high relief. Asteroid Whitehouse does no better; at 16 Pisces, Whitehouse conjoins asteroid Nemesis at 14 Pisces, and Neptune at 13. Distraction, confusion, ineptitude and practiced deceit, all Neptunian traits, lead to a spectacular self-undoing, a retribution of cosmic proportions, as depicted by Nemesis. The square from Whitehouse to Mars at 12 Sagittarius suggests a conflict, battle or struggle of some sort, and asteroid Karma’s inclusion in the pattern from 8 Sagittarius implies that this is based in a fated comeuppance due for prior bad acts. Speaking of which, asteroid Mueller is here too, representing Special Counsel Robert Mueller and the Russia investigation. At 15 Sagittarius, Mueller is exactly quintile (72 degrees, admittedly a minor aspect) the Eclipse, and conjoins both Mars and Karma, suggesting an aggressive, confrontational posture (Mars) which leads to a predestined showdown with Fate (Karma).